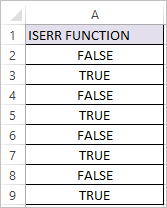 ISERR Function in Excel identifies the Excel Errors Except #N/A, ISERR Function in Excel returns TRUE if the Excel Error is identified except #N/A , if not returns FALSE. Where value argument is the Expression or value to be tested for error. In the above examples divide by 0, #VALUE!, #REF! and #NUM! 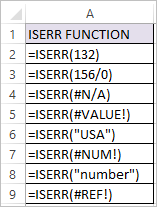 are Excel errors, so ISERR Function returns TRUE. In other Cases (including #N/A) ISERR Function returns FALSE.